Arthur Molinary is one of Britain’s foremost psychics. 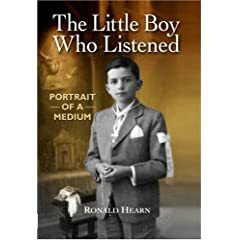 In this awe-inspiring, heartwarming biography, The Little Boy Who Listened: Portrait of a Medium, fellow medium Ronald Hearn traces Molinary’s life from his Spanish Gibraltarian roots to his outstanding career at London’s celebrated College of Psychic Studies and, on the way, provides haunting accounts of some of the medium’s most notable readings, including celebrities such as the singer Sinéad O’Connor, Jerry Hall, Virginia McKenna, Sian Phillips, Geri Halliwell, Freddy Mercury, and MP George Galloway. Ronald shows how Arthur takes every one of his sitters on a journey — from initial doubt, fear and confusion to ultimate solace and reassurance as they are brought into contact with their loved ones in the afterlife. In so doing, it opens up a window onto this passionate, sensitive and gifted man, and sheds light on the hidden, intricate workings of the medium’s mind. An extraordinary tribute to an extraordinary man. Ronald Hearn is an internationally respected and acclaimed medium. Born in London in 1927, he first discovered his gifts at the age of 25 and quickly went on to build up a worldwide reputation for the accuracy of both his private consultations and public demonstrations. He pioneered the use of tape-recorded sittings and has made numerous appearances on television and radio. NextThe Healthiest Possible Diet- For You and For the Rest of Us by Brian Sanderoff, P.D.